Going to a fitness facility is a daily or weekly routine that promotes better health and well-being. With all the professional equipment that it provides, people can develop their muscle mass, lose weight or improve the shape of their body. Aside from the equipment that a gym has, one of the underlying issues for gym operations include making sure the facility and its members are safe. One of the key safety aspects of completing and operating a successful fitness gym is the design of its floor area. A gym is a busy area where aerobics classes, spin classes, yoga and stretching exercises are performed. It also has areas where fitness equipment is arranged for the use of the gym's customers. 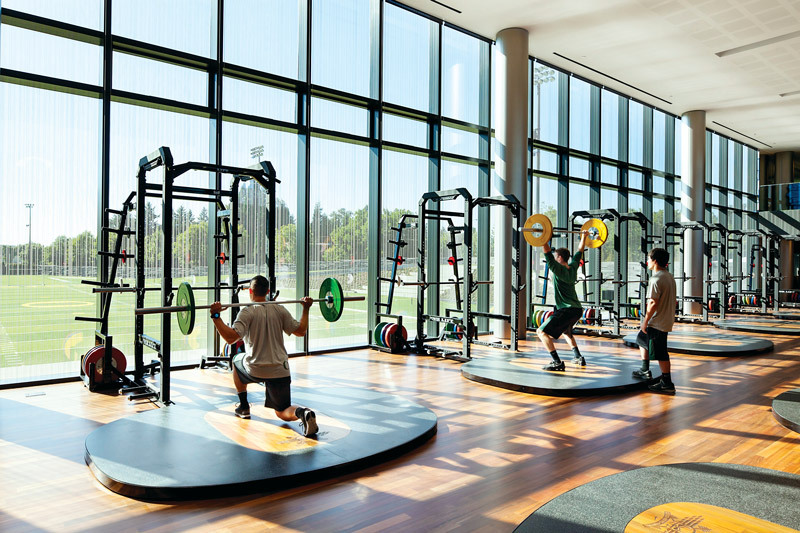 Among the areas that people use, increased safety precautions are always incorporated in its weight rooms. Hence, weight room flooring is usually installed using rubber flooring to prevent accidents while lifting and doing weight exercises and to protect the floor. When it comes to deciding which rubber flooring materials should be used in a gym, quality and performance should always be the number one priorities. Usually, weight rooms are installed with rubber or rubberized materials to provide more secure footing. This type of flooring material comes in rolls, tiles and interlocking tiles. By safety standards, a 3/8"-inch thick rubber flooring is recommended for gym use in order to provide the adequate protection and durability. While larger gyms use rubber rolls, smaller gyms may use interlocking tiles for ease in installation. The interlocking tiles give a small gym owner or home gym owner the ability to remove the tiles and take them with them if the decide to move. The interlocking rubber floor tiles use an interlocking system and it is assembled using center, corner and border tiles and comes available in color options to match your gym. Free-weight areas typically use the 3/8" thick rolled rubber and often will install a half inch - 4'x 6' rubber specialty mat in places where repeated dropping of dumbbells or free weights occur. This gives the added protection needed to protect the underlying floor since the top mat takes all of the punishment. Once the top mat is damaged beyond use, the top mat can be replaced which will be significantly less expensive than replacing the 3/8" roll. Custom rubber tiles can also be an excellent choice if you are looking for something a bit different than the standard rolls or tiles. Custom tiles can be made with a wide variety of colors, designs or logos and can give the gym a unique or custom look. With the use of advanced manufacturing technology and careful attention to the details of product manufacture, premium rubber sports flooring is created to stand up to the test of time. Even with prolonged usage, quality materials continuously provide the safety features that are precisely needed to ensure a safe and slip free gym environment.